It is the idea of Environmental Theater by Richard Schechner; -in situ or contextual theater-, that best describes his art practice. Schechner creates a diagram that explains the different types of theaters. This schema transits between “impure life”—like public events and demonstrations, and “pure art”—traditional theater. It is in the constant transiting between the Impurity of Life and the tradition of art where his art practice found its roots. Endress art process is centered in a strong conceptual research frame where material and forms appear as consequences of the mechanism that best serves to deliver the concept, with a strong entanglement with the socio-cultural context where the project takes place. His research and art practice has been centered on five major areas that develop in parallel and they influence each other. 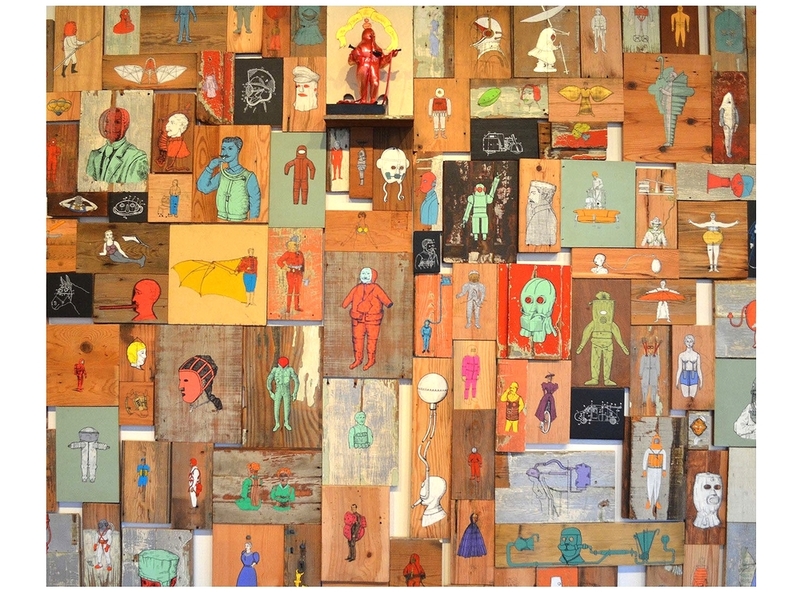 Syncretism and “mestizo” baroque in the Andes region: His work began with the body of work that was originally based on the various power structures and influences exercised over the Latino-American social fabric, particularly in response to the dictatorial process of the 70’s and 80’s. As a consequence his research centered on the colonial and post-colonial tensions that religion and militarism historically imposed on the region. The power structure and the forms of resistance in South America have long manifested themselves in the imaginary, being particularly visible in the Andes region. Through research, his practice has integrated the “mestizo” Baroque that is predominantly displayed in churches and convents. Mestizo Baroque is a platform to question notions of representation and forms of dominance and resistance through the mechanism of art making. In his work, Endress also integrates aspects of contemporary critical discussion about the art practice in South America that re-vindicated traditional manifestations that includes popular culture, carnival, and indigenous. 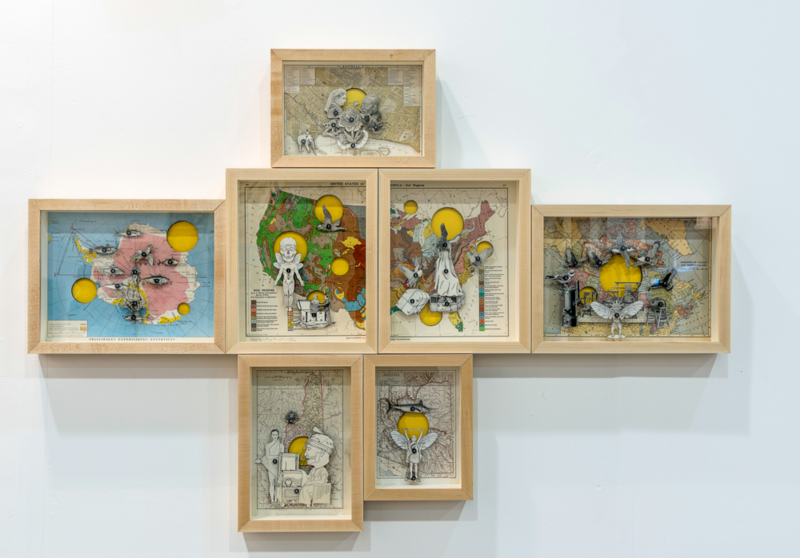 In that context his work re-absorbs popular expressions and materials like embroidery, traditional craftwork, or materials regarded as lower quality. From that perspective he developed of a production platform, ASCHOY (Asociacion Chojcha de la Hoyada), which is a collaborative group based in La Paz, Bolivia. From his interest in popular culture, he expanded into social practice. Work in textile and vernacular painting, carving and generating a dialogue with native groups in the Chaco, Paraguay, and the south of Chile started to become central to his practice. Displacement in the Caribbean: This research focus began by documenting objects discarded by migrants entering the islands, with the collaboration of Lori Lee, an anthropological archaeologist. This body of work examines immigration to the U.S. Virgin Islands in various forms and through different organizing principles. Multiple projects about displacement in the Caribbean have been developed as part of the broader “Bon Dieu Bon” (Good God Good) project. The concept of Baggage centers on the backpack of a Haitian immigrant and its contents. The research for this project brought him to Haiti where he established a strong bond with the art community. As a consequence, he is developing several projects there. “Transfer: is a second body of work related to the Caribbean. Migration is, and always has been, a way of life in the Caribbean. Migrations have been critical for shaping the mental landscapes of the local populations in the past and present. This multifaceted project explores varying degrees of transhumance, including temporary tourists, short-term and long-term migrations, and permanent migrations both legal and illegal. Part of this project has been to research and recompose the imaginary of the islands by exploring the extensive but scattered documentation at the National Archive. These materials are then brought back to the Virgin Islanders and presented on the islands to mitigate colonialism. Participatory art, collective actions, and community-based projects: In 2007, I Endress created the “Floating Lab Collective”. The core of the collective is a group of metropolitan DC-based artists with a strong emphasis in academic research and social participation. Floating Lab Collective was designed to integrate diverse groups of people in different aspects of the process: students, scholars, community, people with different types of expertise to participate in the research process and working collectively on a complex, creative environment of performances, engagement, and media art production and fabrication, without the restraint of the institutional space. The main idea is to expand the space of art into public space and to enlarge the discourse about contemporary art and the interrelation of art and life. Since its foundation FLC has been a partner/collaborator with Provisions library, a research center for art and social change. The projects created by Floating Lab collective investigate relationships between ethics and aesthetics and develop a social platform outside the normative institution frames. Following its inception, FLC has expanded to incorporate artists, community members, and experts in other regions—nationally and internationally, to focus on social practice in local contexts. Media art and interactivity: He began his art practice as a media maker. Video art and film production are at his foundation as an artist. As a new media artist he continually integrate new technologies of production. New Media as a cannibalistic medium quickly adapts into the investigation of forms and experiments in interactivity and expanded media. He has elaborated a series of video installation and interactive pieces. He has participated with a contemporary music ensemble and, in general, his media art practice relates to various areas of research incorporating new media and new technologies. He developed a New Media Experimental Lab at George Mason University to create a platform of research and fabrication. It is a place to activate sustainable and creative research with a social frame of the use and integration of old and new technologies. His interest in developing a larger understanding of material culture and the life of objects as mnemonic markers, translated into a series of ongoing projects that relates to objects, economics, and materials. This research explores our social response to memory and the objects that we discard or we resell as mechanisms of exchange and value. Flea markets, thrift stores, and secondhand stores where the possession, dispossession, and repossession of the object and its transit through different experi­ences are the central components of this part of his research. In an object biography, an object can transform from an object to be disposed of into a personal trea­sure or a status signifier. The projects developed here range from repurposing discarded furniture or recomposing tchotchkes into larger pieces reflecting on ecological issues and creating new narratives with found books. Found Maps installation / variable dimensions. Cartographies of Extraction is an installation composed by a series of maps that proposes new interpretations and explorations of the different geographies. 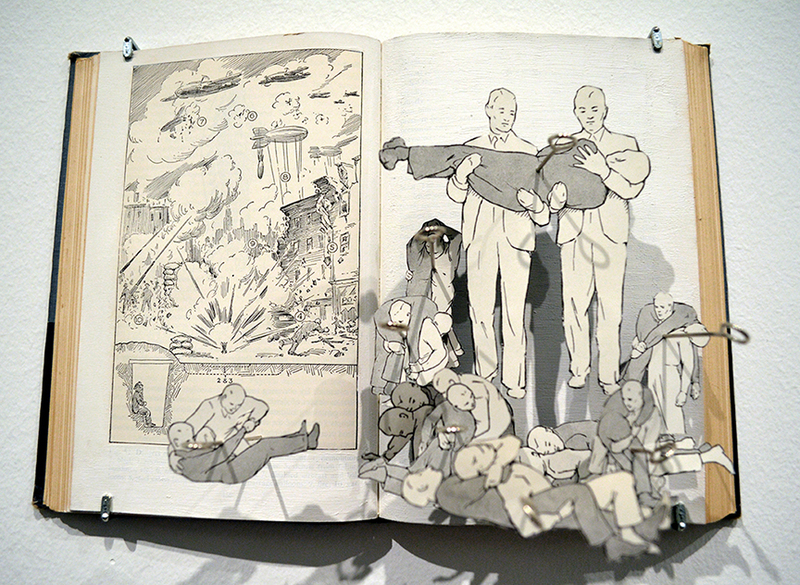 Displacement and deterritorialization are surfaced in the installation, by tensioning commons representations found in books about identity, history, and belonging by extracting sections of the map and inserting cutouts from encyclopedias. The addition of number, black pins adds a poetic taxonomy, one that is at the same time sensible and playful. Is an Installation composed of a number of books (50 in the last exhibit). Cutout from the books are mounted using large needles (used in autopsy) to mount them. This project attempts to investigate the construction of the identity of a territory and its inhabitants by reclaiming the images that have defined identity, race, gender, and the way history has been presented through books like encyclopedias and dictionaries. In the context of the mobility and flow of people, identities are formed in relation to constant tension with the status quo of the institutions that dictate the window from where to observe and how to define. Encyclopedias and dictionaries created by the West craft knowledge about the World and simultaneously define it. This practice results in a colonial and imperialist narrative of the world, its territories, and their inhabitants. My idea is to operate following the concepts that the Mestizo baroque utilized with the baroque European discourse as aesthetic and ideological as well as a colonizing instrument. Visual and verbal forms are ample, dynamic, porous, and permeable in that context. Cultural heresies often entered unnoticed, becoming an imbedded form of resistance. By decomposing and fragmenting an extraction of material from its original function and context, I will incorporate hybrid images to be included in a future provisional book. In this way, dominant hegemonic narratives will be transmogrified into local, personal narratives in the process of returning power through reconstruction of a more self-determined knowledge. This classification explores the arbitrariness (and cultural specificity) of any attempt to categorize the world and demonstrates the “other” to our system of thought. In Foucault’s book the “Order of Things”, Foucault explicates an “archaeological” investigation of knowledge acquisition; he also comments on the fragility of our current means of understanding the world. For Foucault reasoning is the ultimate act of control, delivered through the power of representation to confirm an objective order. Acts of Knowledge begins with a text found in an old social studies text used in U.S. classrooms. This educational text delivers a structural form of knowledge and a series of narratives about the similar and the other. Acts of Knowledge uses the primary forms of knowledge -the encyclopedia- to question the structure imposed by the reasoning. In that context, the acts of estrangement and the visual structuring of the dictionary and the encyclopedias through collages questions the categorization, knowledge, and the arbitrariness of otherness.